10,000 Miles Flown In 114 Hours, 45 Minutes. Martin GMB which made the famous "Round-the-Rim Flight" at Curtis Field, St. Paul, Minn., Sep.16, 1919. In its desire to test the long-range capabilities of its airplane, the Air Service decided to fly a Glenn Martin bomber (GMB) completely around the periphery of the U.S. The flight, which began at Bolling Field, Washington, D.C. on July 24, 1919, was made in a counterclockwise direction. 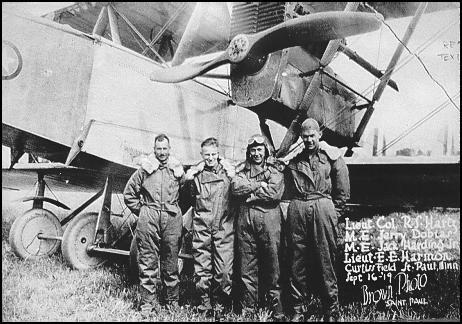 Since time and speed were not factors, the flight proceeded leisurely westward across the northern states, down the Pacific Coast, and eastward along the Mexican border and across the southern states, arriving back at Bolling on Nov. 9, 1919. The total distance of approximately 10,000 miles was flown in 114 hours, 45 minutes. This was a tremendous achievement for such an early period in the development of the multi-engine bomber.